Apartment & Condo Living: How to Maximize Your Space - Reither Construction, Inc. There are many great things about living in a city, but tiny apartments and small rooms can be frustrating. The key to making the most of limited space: knowing how to best utilize every bit of space. Whether you have a studio apartment or small rooms within your home, Reither Construction wants to help you make the most of your living space. It’s easy to feel cramped when you live in the tight quarters of a studio apartment. Because many studio apartments consist of one large space, it is critical to section off different living spaces. If you do not have built in barriers like walls or permanent fixtures to help you with this, position your furniture to create zones. This homeowner built a clever privacy screen around the bed, separating the bed from the rest of the bedroom. This also creates a wall, behind which they placed a runner table that held decorations and lamps that livened up the space. 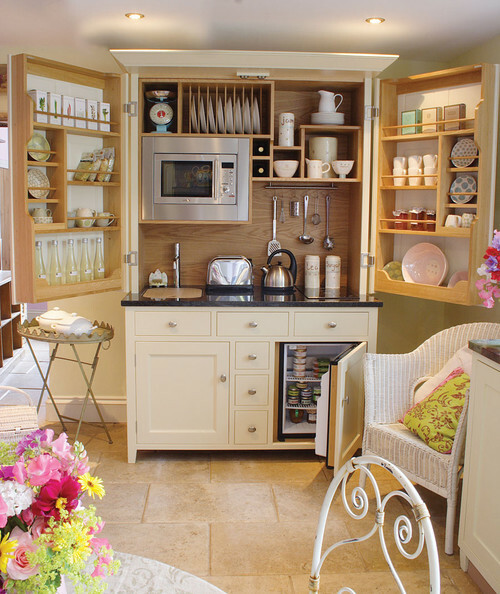 Small kitchens can be very challenging to manage, especially if you feel as though you don’t have enough storage or counter space to work with. 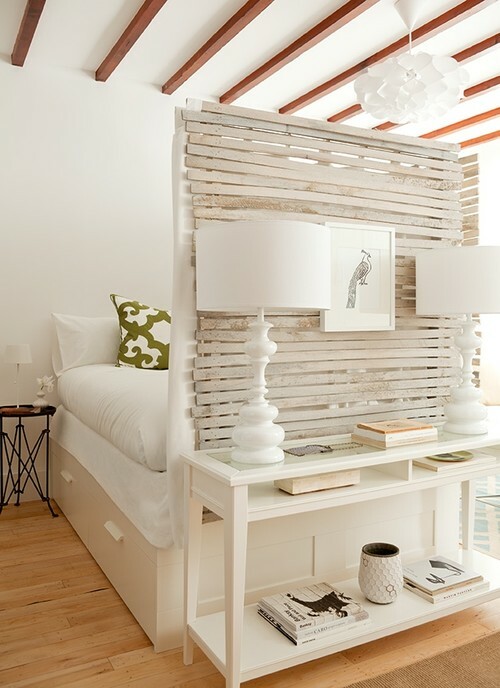 Using walls as hanging storage space is both functional and attractive. Hang up nice pots and pans, cute aprons, and even serves culinary décor a unique line of sight in your kitchen without losing out on space you may have lost with cabinets. 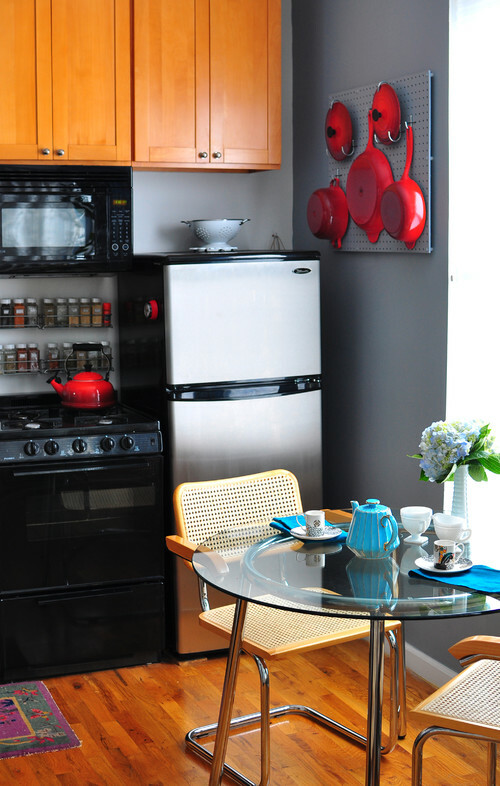 Eclectic Kitchen by Austin Interior Designers & Decorators Scheer & Co.
Having a small, apartment kitchen also means you have to get creative when organizing your appliances. This compact kitchen is the perfect solution to contain everything you need in one area, all encased in pretty white cabinetry. Likely scenario: you want to have enough seating for guests, but don’t have much space to give up for extra chairs. One good solution is to build a built-in, cushion-topped bench that also functions as storage. That way you can have both seating and a space to stash odds and ends that often clutter a small space. Check out the space below that fits a chair, table, and bench in one corner of the room. If you’re in need of a living room centerpiece that utilizes space effectively, consider a multi-level coffee table. For instance, this 2-in-1 coffee table is a great solution when you need to put out party platters and drinks, while also housing magazines and DVDs. You could also consider buying a small table that can be wheeled in and out of the room when you need extra tabletop space. Do you have a small space of your own? How do you make the most of each square foot? You can create the perfect remodeling experience! For more information on remodeling projects contact your Denver Remodeling Contractor, Reither Construction, LLC. Bar & Wine Cellar complete!